On 30 March, Good Friday, Bishop Riscylla shared in the Solemn Liturgy for Good Friday at St Luke's in the morning followed by a similar Liturgy in the afternoon at St Matthew-St Aidan in Buckhorn. 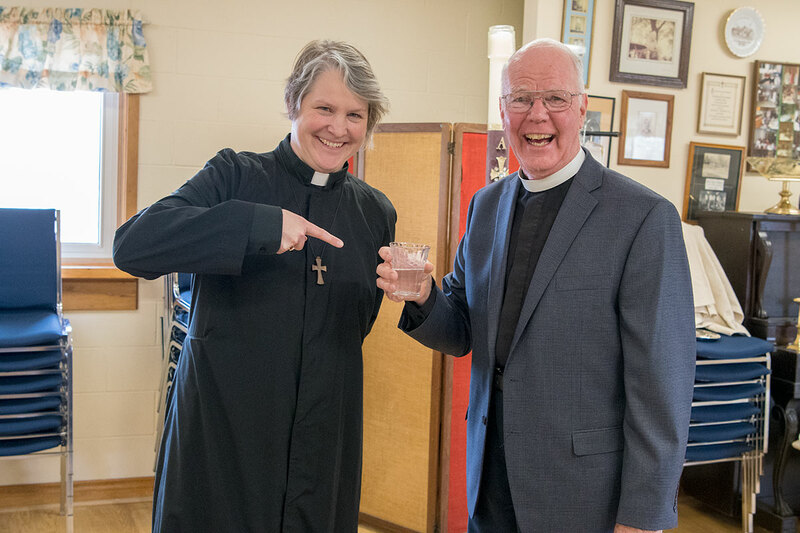 Father Glenn Empey is prienst-in-charge at both parishes. He said that Good Friday is the most solemn day of the Christian year and that it is a necessary step in the journey into Easter. He added that it was especially meaningful to have our Bishop be with us to mark this step in our journey toward Easter and the Sunday of the Resurrection. At St Luke's, in the East City of Peterborough, 112 parishioners gathered to observe Good Friday with Bishop Riscylla. At St Matthew - St Aidan, 28 parishioners including folks from the town comfortably filled the small country church. The Liturgy, from the Book of Alternative Services, included the reading of The Passion of Christ from the Gospel of John, Solemn Prayer, a Meditation on the Cross, silences for reflection and hymns for Good Friday. I was very pleased to be able to share in the Good Friday Liturgies with the people of St Luke's and the people of St Matthew - St Aidan, Bishop Riscyall said. It was wonderful to have the opportunity afterward for relaxed, individual conversations with the people. I was really pleased to have this opportunity to share in the Good Friday journey with the people of St Luke's and the people of St Matthew - St Aidan," Bishop Riscylla said, "It was also a wonderful time for relaxed conversation with individuals and small groups around the refreshment tables in the parish halls. I really enjoyed that." Bishop Riscylla will back in the area for a Confirmation Service in Millbrook on Saturday 21 April. Several candidates from St Luke's will be presented that day. Later in the fall, she will make an official visit to St Matthew - St Aidan on Sunday 30 September. Both parishes extend their sincere thanks to Bishop Riscylla for making time in the busyness of Holy Week to share quiet and reflective time with us as we move on into Easter. Great website. Well done Buckhorn! Blessings and thanks from all of us in Buckhorn.